The Optima pivot showerscreen is a great choice for the home handyman, owner builder or home renovator. 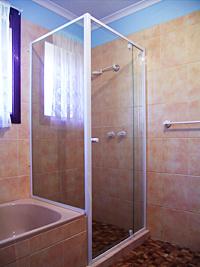 Many homeowners find that they have odd shaped, or out of square shower enclosures and in these instances the DIY showerscreen is here to help. It has a slimline aluminium frame and a unique telescopic frame that allows you to adjust the door and fixed panel to fit your bathroom perfectly. Contact JPS on 0438 631 807 for payment details or alternatively send an email to contactus@jpsshowerscreens.com.au. Transport to be arranged by purchaser.